We know you’ve just recovered from New Year’s Eve but it’s time to dust off the cobwebs because it’s time for round two! Chinese New Year is almost upon us and we’ve the score on where to eat, drink and celebrate. Pop into the Regatta Hotel for a decadent dumpling selection from Simon Fu House of Dumpling! Stuff your face with chicken and mushroom gyoza, vegetable steam bun, charsui poke and scallop and prawn Sui mai – or go all out with a mixed box. Catch them outside in the Courtyard from 2pm on Friday 16th February. Step out of Bowen Hills and into bustling Beijing as King Street transforms for Lunar New Year. 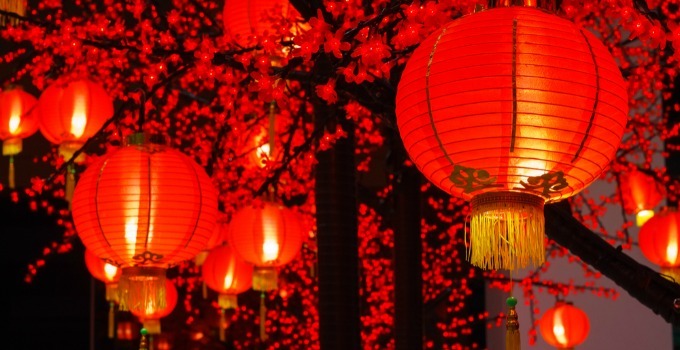 On Friday 16th and Saturday 17th of February the dining precinct will be decorated in vibrant reds and golds, lucky lanterns and feature performances from traditional drummers and lion dancers. The only resolution you’ll need for Year of the Dog is to score a reservation! Lunch or dinner, Fat Dumpling has all your feasting needs sorted. Get stuck into $1 dumplings for lunch, or dine like a king at dinner on shared plates of stir fried greens, braised pork belly and salt and pepper squid. Oh and, did we mention ALL YOU CAN EAT DUMPLINGS? Topped off with fresh mango cake – this is the best $65 you will ever spend. Still hungry for more? Roll into Banoi for an aromatic three-course Vietnamese banquet of crispy spring rolls, your choice of main and a decadent Vietnamese flan for just $30pp. There’s dumpling you should know, are you ready to gyoza? You better be, because Wandering Cooks has teamed up with BrisAsia to bring us Dumpling Day! Originating as a symbol of wealth dumplings were shared amongst family and friends during the Lunar New Year. Learn how to make dumplings from Tibet to Palestine – and better still, EAT THEM! You can bank on having a blast at Sunnybank with their annual five-day Chinese New Year celebrations. This year is set to be a howling success with free cultural activities from noodle making demonstrations to Tai Chi to celebrate Year of the Dog. The festival will finish with a Lunar New Year Rooftop spectacular on March 3, with traditional Lion and Dragon dance performances and a lantern parade. Gorge yourself on Sunnybank’s best with takeaway food available from Rolling Man, Huang Taiji and Undonya Tokoton. Grab yourself an armful of steamed buns, mouth-watering dumplings and more pork noodles than you can poke a chopstick and head to the rooftop dining zone to zen out in the festival atmosphere. Settle in as the sun goes down for a screening of Studio Ghibli film ‘Princess Kaguya’ and revel in a spectacular fireworks display to finish the celebrations with a bang. At least we know a dumpling hangover is easier than a vodka one! - the gourmand who dares you to eat as many xia long bao as her!